Subscribe to the fretjam newsletter to receive new lessons, exclusive tips and extras straight to your inbox. You'll also have my personal email address to get free one-on-one help with overcoming your problems. 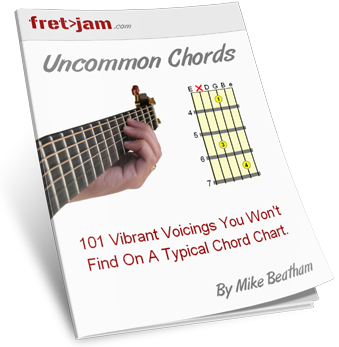 Not only that, but as a thank you for your time, I'll give you my free guitar chord book (download PDF or view online): Uncommon Chords - 101 Vibrant Voicings You Won't Find on a Typical Chord Chart. Inside you'll discover fresh, simple to play chords that will really spice up your playing. This is no ordinary chord chart! I promise to use your email address only to send you the fretjam newsletter and Uncommon Chords. You can unsubscribe at any time by simply clicking a link in the emails I send out. I will NEVER give your email address to any person or company.